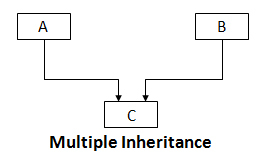 Inheritance in which a derived class is derived from several base class is known as multiple inheritance. A class can inherit the attributes of two or more classes as shown in fig. below. This is known as multiple inheritance. Multiple inheritance allows us to combine the features of several existing classes as a starting point for defining new classes. It is like a child inheriting the physical features of one parent and the intelligence of another. where visibility may be either public or private. The base classes are separated by commas.